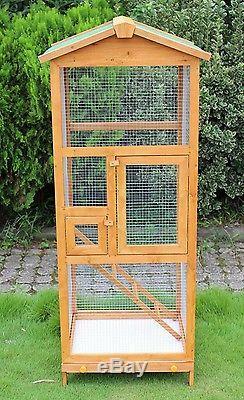 Bird Cage Wooden Large Outdoor Crate Pet Parrot Canary Parakeet Play House. 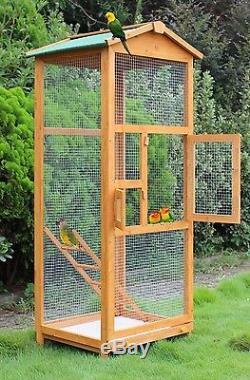 This large bird cage is a perfect for 3 to 4 birds. It gives plenty of room for them to fly and play. With ladder it gives plenty of freedom to move even if they are caged. It offers two doors, the large one to clean and the smaller one to make feeding easily. Color: Natural wood Material: Pine Wood, Metal Grids, Composite Asphalt Roof, Metal Hardware Overall Dimension: 26.8L x 24.8W x 65H Large Door Size: 11.8W x 17.3H Small Door Size: 6.9W x 6.9H Net Weight: 28.7lbs Made of high quality pine wood in excellent craftsmanship Larger door offers easy access to clean and smaller door offers access to feed Pull out tray tray for easy cleaning With green waterproof asphaltic felt roof Fire preventive & waterproof baseboard Outdoor environmental protection lacquer Large space, lightweight, portable, easy to move. All our items are dispatched directly from our suppliers' warehouses across the country. All Items are in stock when they are listed. Inventory is tracked and updated regularly. However if demand exceeds our supply. 3We will offer other items in similar style and quality. And give us the opportunity to help you and be sure that we have what you're looking for. We guarantee that will find a solution. Your feedback is very important to us. Thank you for looking our product! You're welcome to watch our other listings. Please feel free to ask us if you have any questions. We're always happy to communicate with you. Feel Free To Watch Our Other Items! The item "Bird Cage Wooden Large Outdoor Crate Pet Parrot Canary Parakeet Play House" is in sale since Thursday, December 22, 2016. 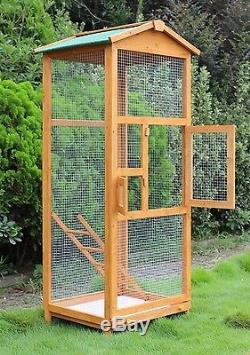 This item is in the category "Pet Supplies\Bird Supplies\Cages". The seller is "allgooditems" and is located in Lynxville, Wisconsin. This item can be shipped to United States.